Since returning from vacation last week I've had no mojo! I think it stayed in California! I headed over to a FB page for us coaches and seen so much great inspiration and finally this card came about. Not sure if I like it but I wanted to use the background piece that I made using our Gel Press, a stencil (Starburst Lines), and Rich Coral Liquid Color. The background is very basic but I need to get the feel of the Press and get it seasoned as right now some inks bubble a bit. I've been told this will quit with time. I used our Whip Cream card stock for the pattern base and the thanks die cut. 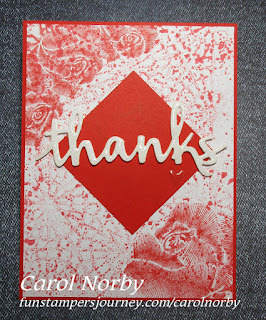 I also used our Embroidered Rose stamp set on the 2 corners and on the Rich Coral square in the center. I used Rich Coral ink as I really like the monotone look. The cool word die comes from our Designer Frames die set. I pop dotted it up, added some Journey Glaze and just a sprinkle of Sparkle Dust. A little heart from our Magical Candy Drops just adds a little surprise. I also used our fabulous Amaze machine and Easy Glide Runner. I hope my mojo comes home soon. 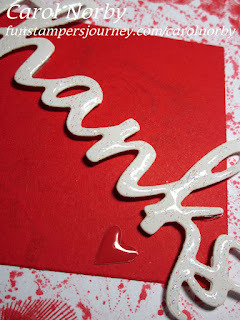 I'm planning on taking part in a FSJ coach blog hop this Saturday. I do have 1 card done but I need a more "fancy" card. I'm also going to Tucson on Saturday for a Rubber Stamp & Scrapbook Expo and meeting friends. I gotta get my cards done and fast! And check out my Stamps for Sale page. Most of these are retired and no longer available but a couple are current, I just didn't like them enough to keep. And a couple are from my old stash from when I was with another company.